Can't help but love this Tor Horror paperback cover for Dark Companions: creepy kid and creepy clown all in one (thanks to artist Jill Bauman)! 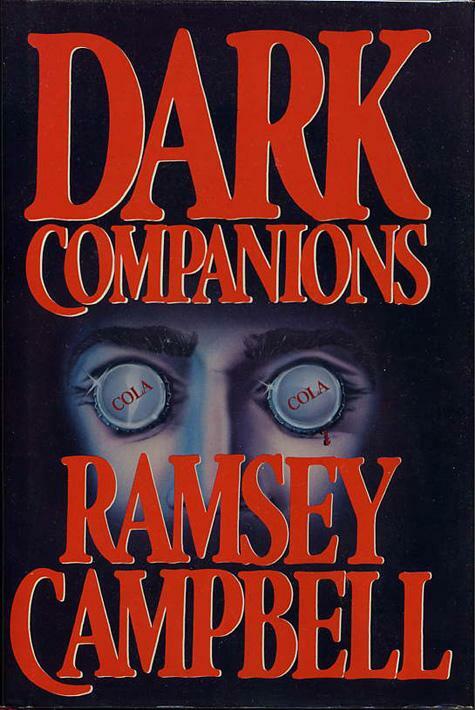 Well-known to fans of horror literature but not to readers outside the field, Liverpudlian Ramsey Campbell has been writing award-winning short stories and novels since the 1960s. Starting out with an Arkham House collection of Lovecraft-inspired terrors, The Inhabitant of the Lake, Campbell then moved on to a more mature style, oblique, chilly, precise, and vaguely unsettling. Many tales are set in his native Liverpool, where characters are dissociated from others, caught in a landscape they can't quite grasp, something's amiss, something's just out of joint. Are the ocean's waves calling my name? What flitted through the debris in the abandoned amusement park? Is that a strangled cry in the dial tone? Why does that decrepit storefront look like a fanged mouth? That child in the park, isn't that the murdered one I saw in all the newspapers? Or am I just imagining - no. 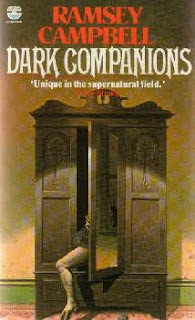 Dark Companions collects 21 of Campbell's stories. However, nowhere on the book is there any indication this is a short-story collection; story titles could just be chapter titles, right? Short story collections have always sold more poorly than novels, although it's quite arguable that horror is best as a short, sharp shock. The award-winners are "Mackintosh Willy," "In the Bag," and "The Chimney." Other must-reads: "Napier Court," "The Companion" (which Stephen King praises unreservedly in his Danse Macabre), and "The Pattern." This 1982 UK paperback cover is not quite as lurid as its American counterpart. My favourite collection of all time - I have the Macmillan 'Mackintosh Willy' hardcover, and the wardrobe cover paperback. Great short fiction, and the paperback has a lot of sentimental value for me. Thanks for the link! Glad you agree DARK COMPANIONS is indeed a fine, strong work. Looking thru your other reviews too. You're welcome. It's definitely one of the better collections I've read in awhile!